The Gowanus Lounge: GL Analysis: Will the City's Huge Building Scandal be Addressed? GL Analysis: Will the City's Huge Building Scandal be Addressed? We won't for a minute claim that the problems with the building and development industry and the violence it inflicts on the quality of life of Brooklyn residents from Sheepshead Bay and the South Slope to Williamsburg and Greenpoint are anything new. Corruption, malfeasance, the development industry and city government have all fit together like hand and glove for generations. Yet, there is something about the excesses of the current building boom and the lack of municipal oversight that have taken problems to new levels. This week, the Daily News ran the kind of series that draws attention to the kind of scandalous nonperformance of city government that imperils quality of life. The series covered outrages in the South Slope, abuse of immigrant workers, the disgusting big picture and more. None of this comes as news to anyone that lives in neighborhood where buildings are going up on every block or who's spent more than five minutes walking around any number of Brooklyn neighborhoods. For a sense of the scope of the problem, consider that the Buildings Department was called on to conduct 413,844 inspections last year with a 350-member inspection force, which works out to 1,182 inspections per person. No wonder builders and developers can get away with everything from undermining neighboring buildings to working illegal hours and doing dangerous work and ignoring Stop Work Orders. The conduct of the Bloomberg Administration on this front--and before it, the Guiliani Administration--has been grossly negligent. Doctoroff said Bloomberg inherited an understaffed and inefficient Buildings Department rife with corruption. "We have made substantial progress," he insisted. He said a new city construction code, expected to be implemented by year's end, will increase penalties for violations and reform aspects of the much-abused honor system that allows architects to certify plans without verification. In neighborhoods like the South Slope where resident pressure and blog coverage has embarrased the Buildings Department, residents say there have been improvements. In other neighborhoods, problems like slow response and inaction persist. Of course, right now, we are only talking about construction-related problem, not the environmental horrors all over North and South Brooklyn to which both the state and the city are turning a blind eye as toxic sites are developed for housing with virtually no proactive public oversight, no information that buyers can access easily and with a kind of environmental clean-up honor system for developers. More oversight is needed on all fronts. And it needs to be put in place quickly. Doctoroff is at the top of the City's building dept and it was his responsibility to enforce the laws and rules on the new condo delevopers he has courted in North Brooklyn that are allowed to build and legally sell property to new owners of condo on which they have built without the full and proper analysis done at both the State and Fed levels/agencies about the existing toxic risks?? Yes- why is there so little or none disclosure given to the buyers of these condos in Williamsburg and Greenpoint?? If they have nothing to hide then post all the data and let many groups have access to analzye it...oh could it be the City the State and the developers are afraid of lawsuits b/c they broke the law?? It should be noted that the Greenpoint residential community was built on clean farmland in the 1800's. Even the waterfront industry in Greenpoint was clean. The major factory was a producer of rope. Not so with Williamsburg. The Eastern District terminal site along the Williamsburg waterfront is a designated toxic brownfield that was home to numerous polluting industries including the Astral oil site. These toxic brownfields are where the new residential properties are being built. All of Greenpoint less desirable industries of the past were located in the eastern industrial section along the Newtown creek. Greenpoint's East river waterfront had been home to lumberyards, rope factories for a century and then was abandoned for nearly half a century. None of Greenpoint's East River waterfront has the toxic history that Williamsburg's Eastern district terminal has. 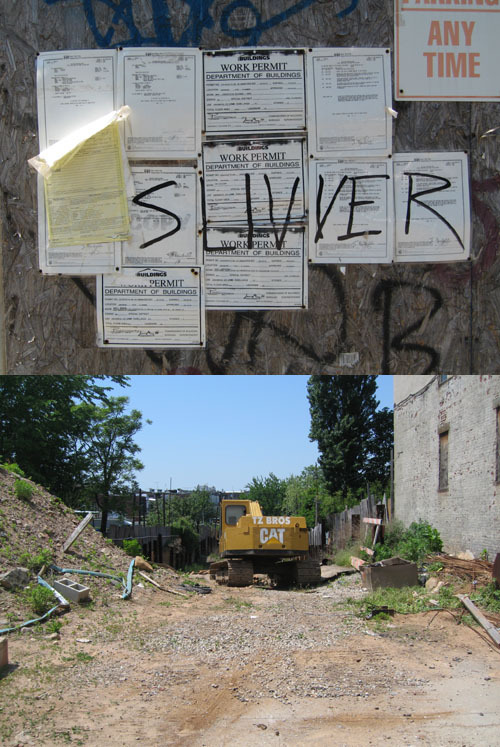 The smear campaign unleashed on Greenpoint, just when we it was rezoned curiously excluded Williamsburg's toxic issues. The media still isn't covering the issues, just day after day coverage of hipsterville. Do a williamsburg search in the NY times. It's pretty revealing.